UW Bothell associate professor Jody Early finds community-based service learning projects can deeply enrich online classes. 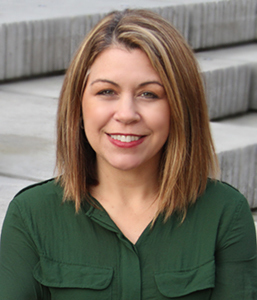 UW Bothell associate professor Jody Early faced a difficult task—Challenging her busy nursing and health studies students with a more meaningful learning experience by combining an online global women’s health class with community-based service learning. Early was determined to find a way for her ‘place-bound’ and non-traditional students—often juggling demanding work schedules and family commitments—to reap the benefits of service learning by partnering with local and international organizations. So she set out to build community online and offline by carefully bringing together seemingly disparate pedagogical approaches in her Women’s Global Health and Human Rights online class. “What draws me to technology is the issue of access,” says Early, associate professor of Nursing and Health Studies. “Offering online and hybrid courses increases pathways for students who, for a variety of reasons, may not be able to earn their degrees otherwise. eLearning, in all of its forms, also enhances flexibility and choice for students who seek a more blended educational experience. Early structured her class to address these issues by seeking to eliminate the sense of loneliness and disconnect often felt by online students. She talked with each student often, and gave them many opportunities to work with peers and community partners. Address the importance of cultural humility: Spend time discussing and reflecting on one’s position relative to the service learning context; explain what reciprocity means in the context of service learning, and don’t assume that students have been exposed to these topics prior to your class. Addressing the importance of cultural humility early on as students prepare to work with community organizations is essential. Provide students with options: Allow students to choose from a variety of projects and offer options that can be completed individually as well as with partners or in groups. This helps to mitigate barriers for students whose work, health and/or life situations might otherwise prevent them from participating in service learning. Her students partnered with Seattle Against Slavery, Northwest Film Forum, Refugee Women’s Alliance, A Call to Men and National Women’s Health Network. They participated in challenging projects that pushed them outside of their academic discipline and comfort zone, and engaged in a broad array of activities, from leading canvassing events against human labor trafficking to curating a digital art exhibit about women’s global issues, even organizing and leading a film screening and panel discussion on International Women’s Day with lauded film director Lynn Shelton. Much of the organizing took place online. 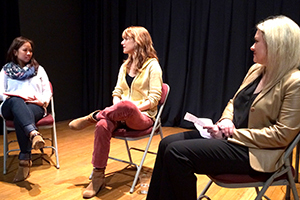 As part of their community-based project, RN-BSN students Leah Ta’an (left) and Anna Kirtovich (right), along with director Lynn Shelton, lead a post-film discussion and public Q&A at the Northwest Film Forum on International Women’s Day. Early’s efforts to build community online and offline paid off, her students say. 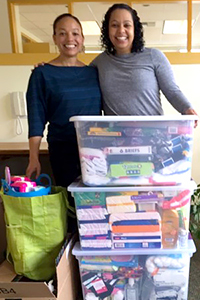 BHS 420 students in Bellingham, WA, organized a supply drive for a local nonprofit organization serving women and children in transitional housing. The class compelled nursing student Varinder Heera to get more involved in issues affecting girls and women. A survey of her class showed that 94 percent of Early’s students ‘strongly agreed’ or ‘agreed’ they felt a sense of community and social connection to their instructor and peers; 84 percent ‘strongly agreed’ or ‘agreed’ they felt motivated throughout the course to explore learning materials, readings and media. Use community-based strategies to enrich online courses: Adding community-based learning to an online course can motivate students and reduce feelings of isolation. Students can have more “hands on” opportunities to apply what they are learning, such as helping organize a community event or getting involved with a non-profit, and to learn from community members and peers. Plan ahead, keep it small and plan for contingencies: Give yourself three to four months’ lead time to plan this type of course, which works best with 30 students or fewer. Work your network to find partner organizations that can benefit from student service. Provide students with options: Allow students to choose from a variety of projects with options that can be completed individually, with a partner or in groups. This helps students design a schedule that works for them and can mitigate barriers for students whose work, health and/or life situations might otherwise prevent them from participating. Ensure good communication: Regular communication with students and community partners is vital to ensure there is reciprocity and to work through unexpected situations. Early builds in mid-quarter progress reports and schedules student conferences as needed. Keep open lines of communication with community partners as well, and schedule check-in phone calls or meetings regularly. Consider community of inquiry (COI) dimensions when designing a class: COI highlights three elements that are critical to successful online learning environments: cognitive presence, social presence and teaching presence. Learn more about COI. “The video lectures and discussions provided a supportive environment and created a feeling of connection with fellow classmates and with Dr. Early. Allowing students to choose from multiple community-based projects, and to work in groups or with a partner, provided independence and flexibility that is much appreciated by adult learners." “Before taking this course, I obviously knew that violence against women existed, but I didn't realize its pervasiveness in our society and globally. By working with A Call to Men, I was able to see how I could be part of the solution. I believe the things I’ve learned in this course have made me a better nurse and a better person." Read how two of Jody Early’s worldly students became contributors to the learning experience at UW Bothell.